Once you start with My Brilliant Friend, you catch a sort of fever. “I don’t usually read like this,” said a customer recently. 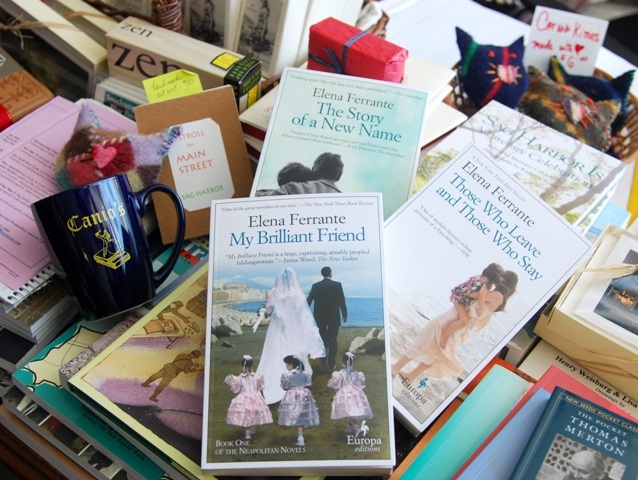 She spoke for many who read Ferrante rapaciously, ravenously. We’re caught in the fiery friendship, hateship, loveship between Lila and Elena, or Lenu as we’ve come to know her, in dialect. And it’s not just an “Italian” thing. Readers worldwide are captivated. “I told my friend, I’ve finished book one and she could borrow it,” a customer in for book two said. “I wondered why she wasn’t at my door first thing to get it.” Which book are you reading? And if you haven’t started on them, what are you waiting for? An afternoon of spring cleaning on a day that actually feels like the season, yielded a surprise. A charming copy of John Steinbeck’s The Red Pony surfaced like a fragile crocus finally breaking ground. This limited edition volume, published in 1937 by Covici Friede Publishers , shows signs of age and wear, but also bears the tiny sticker from New York’s famed Holliday Bookshop. A beloved shop that specialized in British and American literary works, Holliday became an institution over its 30-plus years in business. Later this month we welcome Steinbeck scholar Susan Shillinglaw back to Sag Harbor. She’ll speak on Saturday, April 26 at 5 p.m. as we celebrate the 75th anniversary of the publication of The Grapes of Wrath. Our copy of The Red Pony is signed by Steinbeck and dedicated to his first wife Carol, (see also Shillinglaw’s Carol and John Steinbeck: Portrait of a Marriage). The osprey are back now reminding us of Steinbeck’s love/hate relationship with these mighty raptors. Mostly love. See his humorous essay “My War With the Osprey” reprinted in our Sag Harbor Is: a Literary Celebration. His “war” turns out to be a jousting match between two clever species, one human, one avian. Guess who wins? I field a call from a friend considering entering the book business. What advice do I have? Well, considering it’s the first of the month, April Fool’s Day in fact, and our rent’s due, I advise extreme caution. Yet the appearance of The Red Pony feels hopeful. Our copy’s for sale. It’s number 535 of 699, signed and printed on handmade paper. What’s it worth to you? Who is that woman upstairs? When a new boy enters her third grade class, Nora’s staid life as a quiet, dependable elementary school teacher simmers to scintillating as she falls headlong into an intense friendship with the boy’s mother, Sirena, an artist and the boy’s father, Skandar an intellectual, as well as with the boy himself. Nora’s long suppressed desires to lead her own creative life are tested against the example of Sirena with whom she comes to share a studio. In Claire Messud’s mesmerizing new novel, The Woman Upstairs, she portrays the inner world of Nora with such psychological precision and subtlety, we find we’re falling headlong too, before we even notice. Is it a cautionary tale? A wake-up call for women still struggling to name themselves artists before all others? Read it, and tell us what you think…. We can’t visit a new city without stopping in its bookstores. Who wouldn’t want to, even, or especially, while on vacation? We walked into River Run Books in Portsmouth, New Hampshire where we’d been before albeit in its different locations. Portsmouth is an interesting, historic and lively place, and River Run is a great shop full of contemporary and classic titles, local interest books, second-hand sale books, gifts and a new publishing sideline. While wandering the well-stocked tables and chatting with knowledgeable shop owner Tom, we learned that the next night Salman Rushdie would speak at The Music Hall as part of their Writers on a New England stage series. Rushdie’s new memoir Joseph Anton describes his harrowing experience during the fatwa. It’s also about his school years, his marriages, his life as a writer, the intrigues of the publishing world. Tom saw to our tickets, and to our surprise, even invited us to the V.I.P. reception backstage after the presentation.The historic theatre that dates from 1878 was packed. Over 750 people filled the hall to hear Rushdie read from Joseph Anton and converse with a New Hampshire public radio journalist. You had the feeling the man, the writer was coming back into his own, stepping out from behind a dark curtain of years lived in secrecy, and he emerged confidently as the formidable artist he is. After the talk, some one hundred v.i.p.s crowded into the reception area and nibbled delectable goodies and sipped delicious drinks. When we presented our books to by signed by the author, Rushdie said he remembered Canio’s. He’d been there several times having visited Kurt Vonnegut who’d lived in Sagaponack. Some twenty-plus years have elapsed since then, and unimaginable challenges have been endured. But Rushdie has shaken free those dark years having written this fascinating account — a testament to the strength of his own character. Of course, we invited him to visit Canio’s again. Welcome back, Salman Rushdie! Greg Sumner drove his car from Detroit and parked it in New Jersey. He’s on a Vonnegut tour that brought him through Ithaca to Manhattan, then Sag Harbor. At Canio’s Saturday night he gave a compelling and passionate presentation that might be summed up as follows: read more Vonnegut now! Sumner’s book, Unstuck in Time looks at Vonnegut’s life through the novels and charts his literary development from childhood days in Indiana to time spent as a prisoner of war in Germany. Sumner himself is also from Indiana. He teaches history at University of Detroit Mercy and has taught in Rome as a Fulbright senior lecturer. Greg’s Italian accent is excellent we later learned over pizza before his bus back to New York. The next day, he’d be on to Cape Cod, East Sandwich to be precise. It’s a whirlwind tour, to be sure, but one that Sumner seems to be relishing. He explained he “found a friend” in Vonnegut through the novels. Someone who could look death and destruction in the eye, witness the bombing of Dresden, and live to tell about it in way that transformed the experience, that’s someone to read and learn from. Vonnegut’s father was an architect. The novelist studied anthropology; he was concerned about what an over-reliance on machines would do to people. And he was a old-fashioned guy, a true patriot who questioned his country because he loved it. During Sumner’s short visit to the East End (just a few short hours), he noticed signs for the upcoming Soldier Ride event. It’s a cause Vonnegut would have appreciated, Greg told us, holding up the Soldier Ride t-shirt he bought to support the effort. Sumner’s book was released on the anniversary of Vonnegut’s birth, November 11, a meaningful connection for the author. His erudite presentation enthralled all, and his graciousness was impressive. Is that a Midwest trait? At the conclusion of his talk, Sumner presented us with a commemorative pen from the Kurt Vonnegut Memorial Library, a place we hope to one day visit. Soon as we finish reading Bluebeard! We have a few signed copies of Greg Sumner’s book, Unstuck in Time. Highly recommended!